This isn’t a licensed Star Wars item, but apart from being vintage I can’t find any other info about it. 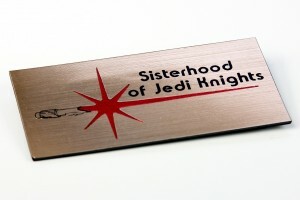 Found while checking one of my bookmarked Star Wars sellers on Ebay is this awesome ‘Sisterhood of Jedi Knights’ pin. Measuring approximately 8cm x 4cm, made of plastic, the front is a pale gold faux brushed metal with engraved details. The red lightsaber colour looks really neat in person, though hard to capture in a photo as the front is very reflective. The back is plain black, with a silver metal brooch pin glued in place. I thought it was just such a fun vintage piece very obviously celebrating female Star Wars fans, I had to have it! Even though jedi knights don’t have red lightsabers, but that detail only speaks to it’s vintage origins when the colours of sith and jedi lightsabers weren’t fully explained. *update* while I still have’t found further information about this particular pin, I have found the inspiration. 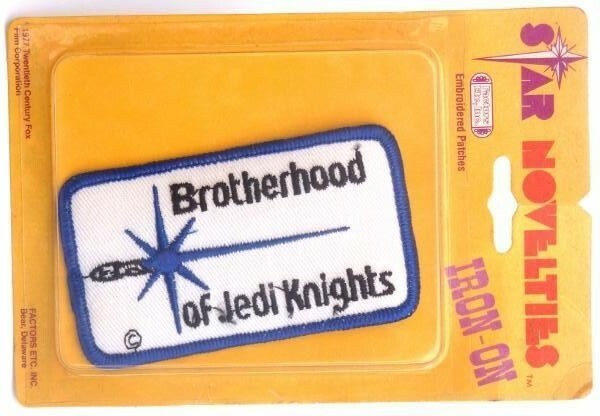 I spotted a vintage patch on ebay, with packaging that indicates it was made by Factors Etc, Inc and licensed by 20th Century Fox in 1977. The patch features a similar design, except the text reads ‘Brotherhood’, with a blue lightsaber. Photo sourced from and belongs to ebay seller starzonetoys.